There's been some discussion about various pieces, how they'd fare on different boards, the likelyhood of draws. In a spirit of fun, I'd like to offer a competitive way to evaluate the various pieces and positions taken. In a spirit of humility, I'm admitting I'm only doing presets because I can't do Zillions. And I have trouble with presets. So I'm going to cheat a lot with the initial presentation, since part of it's done and I'm merely going to put it all on this page, or put links on this page. - play games to verify the theoretical numbers. Zillions would be nice. So would some email games. So would other pieces and games from other people. I encourage additions and comments. Obviously the ground-rules have to be a little tighter or there's a thousand games that will have a few people saying: "I want this army against the FIDEs!" That's great, but who's going to do the work? The rather harsh expression "Put up or shut up!" is tempting to use here… but I think I'll go with "Put up and shut up", as long as everyone realizes I only mean to "put up" a minimalist game with rules and preset, rather than argue in words or just numbers. Able to be understood would be nice. Pretty and well-written would be awesome. I'm shooting for decent, myself. I think pictures of the pieces should be in here, too, since you can pull them right off the preset, for "decent". Civil would be very nice, and also respectful [which isn't all that easy sometimes, I know], but enough of how I should write my stuff here, on with the show. Put up the name of the game, list the non-FIDE pieces with rules, and link to a preset. Have a discussion of what you feel the game makes obvious, or at least shines some light on, and why. - that shortrange games can be less drawish than FIDE. Hero - The Hero may move either 1 or 2 steps each turn. If moving two steps, it uses both parts of its move. The two parts of its move are a 1 square orthogonal slide and a 2 square orthogonal leap. It may slide 1; or jump 2; or slide 1 and jump 2; or jump 2 and slide 1. This piece is a linear mover. It may not change directions during its move. It captures by replacement, stopping and ending its turn on the square of the piece captured.Shaman - The Shaman is the diagonal analog of the Hero. It slides 1 and/or jumps 2 in a diagonal line. This piece is a linear mover. It may not change directions during its move. It captures by replacement, stopping and ending its turn on the square of the piece captured.WarElephant - The WarElephant may move as either as either the Hero or Shaman. It may step one square, leap two squares, or do both, in either order, in either an orthogonal or diagonal direction. It moves in a straight line; it may not change directions during a turn. It captures by replacement, stopping and ending its turn on the square of the piece captured. "Jumping General". Moves as the modern elephant [AF] or warmachine [DW]. It may move 1 square or leap 2 squares orthogonally or diagonally.Minister. Moves like the knight, dababbah, or wazir. It slides 1 or jumps 2 squares orthogonally, or jumps in the standard knight's "L".High priestess. Moves like the knight, alfil, or ferz. It slides 1 or jumps 2 squares diagonally, or jumps in the standard knight's "L". Oliphant Oliphant, a double elephantrider. Moves twice as an alfil or ferz. It slides 1 or jumps 2 squares diagonally, and then may do either again. Thus it may move 1, 2, 3, or 4 squares. It must move in a straight line. LightningWarMachine Lightning warmachine, a double dababbarider. Moves twice as a dabbabah or wazir. It slides 1 or jumps 2 squares orthogonally, then may do either again. It also can move 1, 2, 3 or 4 squares. It must move in a straight line. Now I get really unfair. Note that none of the Lems moves more than 3 squares, and they are very colorbound. How fair is this? Answer: very unfair. The FIDEs are totally outclassed. Sliding General - This piece is a combination of 2 guards. It slides 1 or 2 squares. It may not jump. It may change direction during its move. It may not make a null move [move off and then back onto its starting square]. It captures by landing directly on an opposing piece and ending its turn.Bent Shaman - This piece is a combination of alfil and ferz. It may step 1 square diagonally and/or jump 2 squares diagonally, for a maximum of 3 squares moved per turn. It may: step 1 square; or jump 2 squares; or step 1 and jump 2 squares; or jump 2 squares then step 1 more square, always diagonally. It may change direction during its move. It captures by landing directly on an opposing piece and ending its turn. This is a colorbound piece.Bent Hero - This piece is a combination of dabbabah and wazir. It steps 1 square orthogonally and or jumps 2 squares orthogonally, for a maximum of 3 squares per turn. It may: step 1 square; or jump 2 squares; or step 1 and jump 2 squares; or jump 2 squares then step 1 more square, always orthogonally. It may change direction during its move. It captures by landing directly on an opposing piece and ending its turn.War Elephant - This is a combination of ferz, alfil, and dabbabah. It may move 1 square diagonally; or jump 2 squares either orthogonally or diagonally. It captures by landing directly on an opposing piece and ending its turn. This is a colorbound piece. This is just a simple addition of the shortrange Minister and High Priestess from "Two Large Shatranj Variants" to Lemurian Shatranj, and use of the Grand Chess setup. It will probably turn out to be a more fair game than the CwDA version, FIDEs vs Lems. Once you see how the pieces move, it should be obvious that the FIDEs, even with the Chancellor and Archbishop, do not have a chance. To compare the draw potential of short vs longrange pieces, I suggest playing Modern Shatranj D vs Modern Shatranj R - the difference is that one uses the rook [MS-R] and the other uses the augmented Dabbabah, the warmachine [dabbabah plus wazir]. My argument here is that you will get fewer draws with the modern dabbabahs than you will using rooks in the game. I do think that playing the other games provided will demonstrate my 2 points: first, that shortrange pieces are both interesting and quite able to hold their own against the traditional "power" pieces; and second, that draws are not necessarily associated with a preponderance of shortrange pieces. As far as I understood those pieces are "close" types. Thus by SMIRF's method their third value element is always zero because both first elements are equal. It results (please verify this) in 8x8 values: Minister 6+5/7, High Priestess 6+1/28, in 10x10 values: Minister 6+44/45, High Priestess 6+19/45. Thus a Minister seems to be about 1/2 Pawn unit more valued than a High Priestess. But the results are about the same. There is a minor thing that puzzles me about these numbers. That is the value of the knight, minister and high priestess all go up a slight amount on a larger board when logically these values should decrease slightly. It certainly doesn't appear to be very significant when dealing with chessboards of around 100 squares. The error is no greater than maybe half a pawn. But it's interesting that the one odd FIDE piece, the knight, is the one to give apparently contrary results. It's a fair bet the 2 things are related. Those pieces are weakened at the corner area. But because that part of the board is becoming less important in bigger boards those pieces increase a little bit in their value at a 10x10 board. "Those pieces are weakened at the corner area. But because that part of the board is becoming less important in bigger boards those pieces increase a little bit in their value at a 10x10 board." At first, I didn't buy this statement, but then I started thinking about just how big the edge is in a chess variant. On an 8x8 board, 28 of 64 squares are edge squares, or just under about 45% of all board positions; on a 10x10, it's 36, both squares and percent. This obviously has a massive effect on pieces that are crippled at the edges, and among the sliders, this includes bishops. The 12x12 gives 44 of 144 squares, or about 28% [please forgive minor inaccuracies in the numbers; being a technological Neanderthal, I do them all quickly, and roughly, in my head]; for 16x12, it's 52 of 192 squares, around 26%. Even on the largest boards I've used, 20x30 and 24x24, it comes in at about 16%, giving a still very large effect. On a 100x100, it drops to 4%. So piece value calculations on this size board *should* give one very close to "true" values. I'm not ready to do all the calcs, but I would like to speculate a little. The shortrange piece values should "flatten out" and approach a "true calculated value" [if that phrase has any meaning]. An observation [if I understand this correctly]: the value of the bishop should increase somewhat relative to the other sliders, or, better/more obviously, relative to the rook, as board size increases. A question: as the size of the board approaches infinity, does the value of the rook approach infinity, or does it approach some limit? Hello Joe, to calculate your desired infinite board "true" piece values, I suggest to switch to an 8x8 thorus board, whithout any corner at all. There you will get those "final" numbers. When calculating numbers please do not forget, that SMIRF is digging for relative figures compared to a Pawn value always defined as 1, which is also increasing as absolute number within its limit, where colums would be added. all values are relative and cannot be transfered between variants.-in other words I don't think there is a "true" piece value. board geometry is important. For instance there are many (infinitely many?) infinite boards - at one extreme I can imagine a board of infinite cells existing in infinite dimensions such that each cell is adjacent to every other cell; while at the other there might be an infinite board just 1 cell wide. the number and type of other pieces in play should, I feel, have an effect on a piece's relative value. Not sure where to start, so I guess I'll just jump into the middle. I don't think that piece values are non-transferrable from one variant to the next. I don't fully agree with your first, second, and fourth statements, which I see as all part and parcel of the same idea. I don't believe there is a single "true" value for any piece, but I do believe that in the vast majority of circumstances we are liable to see, there is a number value for a piece which most variants [that we would see at CV, for example] that contain that piece will come close to - poorly expressed, but you get the idea. There are infinite numbers of boards, and the geometry of the board can be crucial - consider your linear infinite board in 2 versions, an orthogonal one and a diagonal one - clearly the values of bishop and rook are greatly affected by which board they're on. But you won't get many games using either of those boards among the games played online. I was thinking of an infinite 2D board, or at least a very large roughly square 2D board [which is not at all the same thing, admittedly]. I agree the type of piece affects the value of the other pieces, and vice-versa, again, poorly expressed, but, again, you get the idea. However, I don't agree that the number of pieces affects the value of a piece. The number of moves per turn maybe, but with the "FIDE Rules unless otherwise specified" stipulation, I don't see why sheer numbers of a piece will change the values of the pieces on the board. My argument with your 1st, 2nd, and 4th statements is more in degree than in kind, though. I see what you're saying and I appreciate it, and can see where you're coming from. I just don't go as far as you do in that direction; I veer to the sides, or take a somewhat different road. But specifics here can be cheerfully argued over at another time. I'll end this here, and take up statement 3 separately. I was in a rush when I posted my initial calculations, and I screwed up the numbers, didn't error check, and omitted any caveats - all cardinal sins. First, I am also not sure the toroidal approximation is accurate or adequate - I only looked at it from the point of view of the Minister and High Priestess pieces, where it seems to be fine; 10x10 or 100x100, the numbers come out the same. I then assumed it was also good for the sliders, without running numbers. First error [and obvious]. Then I used Reinhard's numbers for the 8x8s for my 10x10 calcs for B and R - error 2. And I never stated I had doubts about the method: error 3. So, once again, I rush what I'm trying to do, then get to repent at leisure. Now I'll try to do this systematically. Clearly, as the board gets larger, the value of the bishop approaches that of the rook. Now there's just 1 more piece of the puzzle left to do. The last piece is doing rook and bishop calcs for a 20x20 torus. Conclusion: a smaller toroidal board is not equivalent to a larger "flat" 2D board. So, shortrange pieces apparently approach a maximum value asymptotically as board size increases; and unlimited sliders quickly converge toward the strongest piece value and increase to infinity as the board [2D, flat] increases to infinity. just a quick note wrt to number of pieces affecting piece value. My thinking here is that it is all very well having a move potential of say,14 cells, but it does you no good if your stuck behind a triple row of Pawns. In other words if a piece is blockable it is of less value than a similar piece that can leap. And I think the difference between the two is afected by the number of pieces in play. Again, with CAST, I am trying to introduce a negative "blocking" value based on the initial density factor. With sliders, both sides' pieces create blocks; with leapers, only your own side creates blocks, so the effect of density is halved. Also, I think the maximum value, under this method of evalaution, for a shortrange piece is given by the toroidal board. Thus a Pawn always has an absolute value of 4, while a Knight has 16 - or a maximum relative value 4. The obverse of density and negative blocking arises with those pieces that need a screen in order to effect a capture. Here a higher density has a positive effect - but I'm still struggling to quantify either. Too many questions…, I should have stuck with playing Bridge or Poker! I have been applying the 'contest' method for determining empirical piece values for some time, now, and it works quite well. It turns out that, to a high degree of accurracy, an imbalance in material corresponds to a winning probability for the given posiiton that is additive. 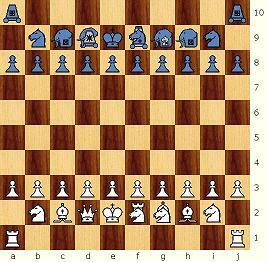 So, for instance, if being a Pawn ahead in the opening produces a score of 62% in a match of several hundred games (excess score 12%), and having a Chancellor in stead of a Queen (again in the openening) a score of 45% (excess score -5%), then having a Chancellor plus a Pawn against a Queen produces an excess score 12%-5%=7% (i.e. total score 57%). This obviously only works for scores close enough to 50%; if Knight odds from the opening would score 85% (excess 35%), being two Knights ahead cannot produce a score of 120%. For material imbalance so big that the score gets outside the range 30-70% there no longer is a linear relation between imbalance and excess score, as the latter tails off to +/- 50%. This makes it possible to predict scores (for games played from the early opening phase) from a set of piece values, simply adding the piece values for each side, and taking the difference. Conversely, by playing a large number of matches from opening positions with a material imbalance, you can derive a set of piece values that optimally predict the scores. For instance, on an 10x8 board with Capablanca pieces, a Pawn advantage typically translates to a 12% score advantage. Playing an unpaired Bishop against a Knight (i.e. deleting B+N for one side, and B+B for the other from the opening array) gives a 6% excess in fafour of the Bishop. Playing a paired B vs N (so deleting B on one side, and N on the other) gives an excess of 12% for the Bishop. Deleting B on one side and N+P for the other, the score becomes equal. Note in particular how strong an Archbishop is in real play; the given value is based on the observation that A hbeats R+B and R+N+P, that A+P beats Q or C, and that even a pair of Archbishops plus a Pawn have no trouble in beating a pair of Chancellors. You did not mention what you base these claims on, or even what size board they apply to. But they seem very far from realistic. A Commoner is very similar in value to a Knight, as might be expected, as they are both short-range pieces with 8 moves. As to global properties, the Knight has more 'speed', but the Commoner has mating potential. 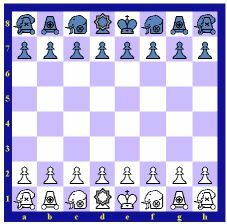 Mating potential in general isn't worth very much, as most games are decided in the presence of Pawns. Perhaps the strongest advantage of the Commoner is that it is a 'strong defender', able to salvage a draw against a super-piece like Queen, which even a Rook cannot. Even tests with engines that take all that into account, the end-game value of the Commoner tests hardly better than that of a Knight, perhaps 0.2 Pawn (e.g. 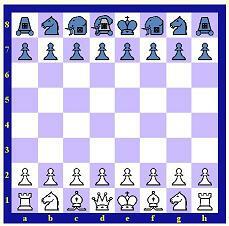 by playing one side with 1 or 2 Knights and the other with 1 or 2 Commoners, in the presence of 3-5 Pawns each). For opening value, the Commoner tests slightly weaker than Knight (e.g. replacing one side's Knights by Commoners in the FIDE setup).